Flick your wrist to see the time! Shake hands to answer the call! Make your daily life easier with a smart watch! Android system(Android 5.0 and Above) and IOS(IOS 9.0 and Above)System. 1.Work with SIM card(the SIM card is not included): If you insert SIM card into the watch but didn't connect the watch with your phone, you can make/receive calls.read/send messags(notice: the smartwatch support 2G Nano SIM card, GSM：850/900/1800/1900 quad-bands). 2.Work without SIM card : If you have no SIM card in the watch but connected the watch with your phone via bluetooth successfully, you can make/receive calls but not be able to send messages, if you want to send messages, the SIM card is a must have. Need to connect both via bluetooth and Fundo Wear APP, support both apple iphone and Android calls, SMS, SNS, facebook, whatsapp, email, wechat and other app notification. First way, connect your phone with watch via bluetooth, operate on your phone. Then, the watch will play music. Second way, use TF card (not included), please make sure your TF card support up to 16GB(not 32GB) and the TF card have stored the music. 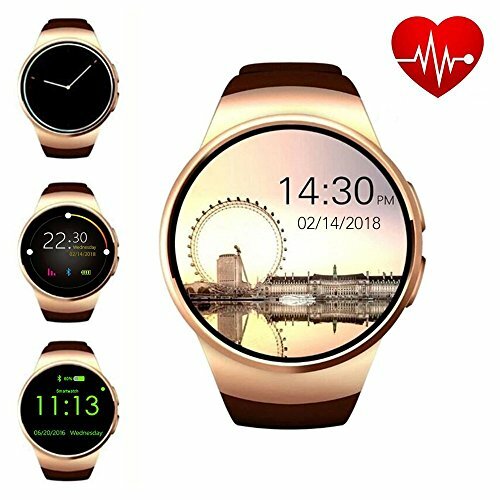 Heart rate monitor, remote camara, remote music, pedometer, sleep monitoring, anti-lost, sedentary remind, alarmclock, calculator, stopwatch, recorder, video, dialer, magic voice, music player,etc. iPhone users will find two "KW18" when bluetooth connection, please click both connection or it will fail connection, please read user manual detailed operation. Side SIM Card and TF card Slot: The smart watch support Nano SIM card(recommend AT&T US and T-mobile US), make/receive call and texts easier! patent design for card slot, SIM card(support GSM：850/900/1800/1900 quad-bands), TF card(support up to 16GB)are Two-In-One. Touch Screen, Waterproof and Dustproof Design: The blutooth smart watch have 1.3 inch IPS LCD round screen, anti-scratch, anti-broken. support daily waterproof life (please do not wear the smartwatches when you are swimming or bathing). Compatible For: Android system(Android 5.0 and above), IOS(IOS 9.0 and above)system, such as: Samsung, LG, HTC, OPPO, Sony, iPhone and so on. Health Monitor and Other Functions: Flick your wrist to see the time! Shake hands to answer the call! Heart rate monitor, remote camara, remote music, pedometer, sleep monitoring, anti-lost, sedentary remind, alarm clock, calculator, stopwatch, recorder, video, dialer, magic voice, bluetooth information notifications synced etc. If you have any questions about this product by ZAOYI, contact us by completing and submitting the form below. If you are looking for a specif part number, please include it with your message.